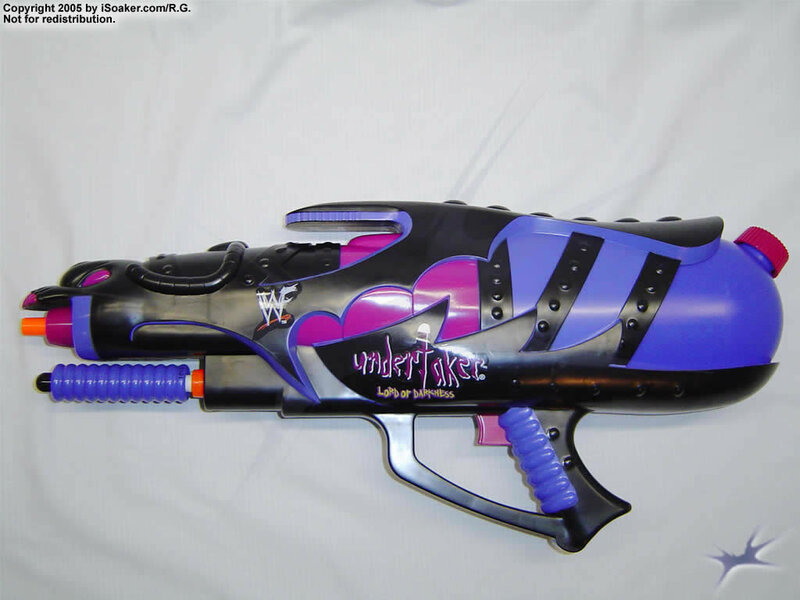 The Super Soaker WWF: Undertaker is one of the 2000 series of collectible blasters, sporting the World Wrestling Federation logo on its side as well as being named after a popular wrestler. This black and purple blaster has a styling quite different from previous blaster designs. Thankfully, unlike the Star Wars™ series blasters which were based on the pressurized reservoir firing system, the WWF series uses CPS technology. The end result is a novelty blaster which actually performs quite well. The firing chamber is a decent size, basically emptying the reservoir with each complete fill. The stream thickness is about equivalent to an XP. Though this blaster does not have the power of true CPS-class blasters, it does fire for quite a long time on a full charge. The Super Soaker WWF:Undertaker, however, has a couple of annoying traits. The pump grip is smaller than other similarly-size blasters, meaning that larger hands will not be able to give full pumps without hitting their fingers on the barrel of the blaster. Also, the grip where the trigger lies is quite short. This, too, may be awkward for those with larger hands. However, despite these short comings, the blaster performs quite well and could hold its own in most small and medium sized skirmishes. Just beware of those with true CPS-class blasters and/or Monsters. CPS-technology, dark colours for hiding and a decent sized firing chamber as well as reservoir makes this a good blaster to use. Stream size quite small and can be outclassed by virtually any CPS blaster. Pump handle and grip also small and may be uncomfortable to use for those with larger hands.